Faithful readers may recall that Erica and Jessica left not just the county, but the country right after Thanksgiving, something for which I was not thankful. They left most of their belongings in storage in the county seat, so after a few months of camping in their rented accommodations abroad, they made a flying trip back to pick up their stuff and drive it back to their new home. And I do mean flying. They flew in one evening, met us for dinner the next, and took off the very next day. I felt lucky that they found time to have dinner with Megan, some other friends, and me before they vanished. Both Erica and Jessica are very happy in their new milieu, though they were a bit taken aback by the snow and cold, also the weight of loonies and toonies and how quickly they accumulate. When I lived in Canada, my coping mechanism was to decant them into a bowl and cash them in for dinner or a present when there was about $100. We had dinner at the fake Libby’s. The real Libby’s closed a couple of years ago, taking its fabulous al pastor with it. 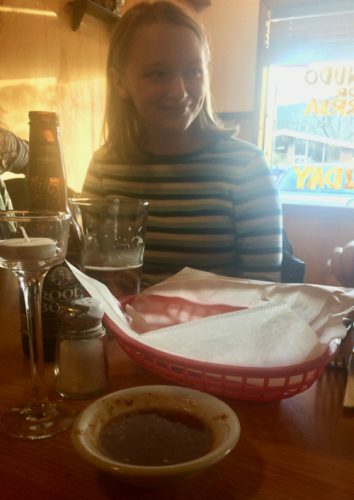 I was happy for Libby that she could take a well-deserved retirement, but not happy to live an al pastor-free life for the foreseeable future. The people at the fake Libby’s bought the real Libby’s recipes. It was good, but it lacked the depth and magic. Erica sneakily paid the bill before Megan and I could pay for Erica and Jessica’s dinners. It was wonderful to see them, but so hard to say goodbye. It feels so final now. No more Halloweens, Thanksgivings, or Junapalooza. No more Jessica reading “Red Ranger Came Calling” with Jonathan at Christmas. Jessica turns 16 in a couple of weeks (“Every April 15”) and we’ll miss that and all her growing up. A YEAR AGO: A look around. FIVE YEARS AGO: A high school play production of the beloved classic film “The Breakfast Club”. TEN YEARS AGO: Thinking of moving from Oaktown. Which I did, eventually. And I have never looked back.